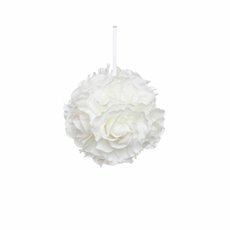 Rose balls are beautiful decor pieces and staple wedding decorations. You can find the perfect rose ball right here at Koch & Co online today. Made from only high quality materials, you can choose from iconic colours such as white and pink and save with wholesale prices. Rich in history and meaning, rose balls (also known as flower pomander balls or rose kissing balls) symbolise romance and good fortune. 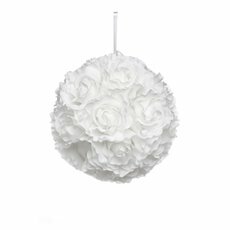 Commonly worn by the flower girl or the bride during the ceremony, silk rose balls add a little something special to your wedding. These pretty decor pieces will effortlessly add a touch of elegance to any wedding party decoration too. Hang them from wedding arches, behind guests seats or place atop tall standing glass vases for a charming table centerpiece. 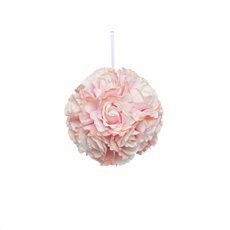 No matter how you decide to use flower pomander balls on your special day, they will always be a lovely touch. Artificial roses are timeless and classic in weddings, so you don’t have to just stop at rose flower balls when it comes to decorating! Incorporate Koch & Co’s gorgeous fresh roses into your wedding reception centrepieces or even into your bridal bouquet. You can also have your guests use artificial rose petals as confetti as you walk down the aisle! For more wedding decoration inspiration, head to the Koch Blog or check out our DIY ideas. We have all of the essentials you need to decorate your special event - from candles, fairy lights, ribbons, artificial plants, to greenery and more! With over 80 years of experience, you can be rest assured that your silk rose balls will look gorgeous on your special day; not to mention, you can also keep them as a special memento! Shop the full collection of silk flowers and event decoration online at Koch & Co today.